Since I'm such a skincare obsess now, I want to share with you my skincare wishlist. These two brands are definitely among the higher ends especially in the UK. This is a perfect kit to learn about the brand products. According to the website, Omorovicza products are powered by a potent blend of Hungary’s mineral-rich healing waters and our patented Hydro Mineral Transference™ delivery system. This is combined with the finest vitamins, essential oils and other natural ingredients from across the globe, from the bed of Lake Heviz to the peak of the Andes mountains. Their products exclude parabens, polyethylene glycol, petrochemicals, silicones, sodium laureth sulfates, synthetic colours and fragrances which is always a plus. I'd say this kit is almost complete to try out their cult and best selling products. Included in the kit - cleansing foam, thermal cleansing balm, deep cleansing mask, queen of hungary mist and illuminating moisturiser. I have few products that I might buy in full size but I'm going to try them first to see if they are superior than what I have used. This brand caught my attention as Sarah Chapman is a beauty specialist and skincare expert And London’s most sought-after facialist. I mean she must know everything to do with skin to be able to create her own skincare line, right? You can check the review [here] from my favourite beauty blogger! Anna. I do find her range to be very expensive! I'm gna have to think more than twice but if I have to choose just one product (ok, this is hardddd! Ermm...) Intense Hydrating booster. 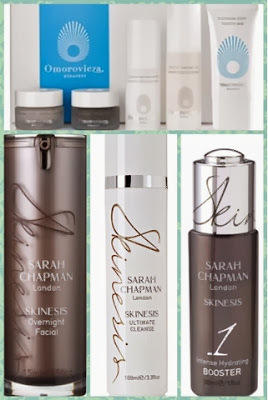 I wanted to choose Facial Overnight but for the price £45 for 15ml, so the serum win at £57 for 30ml. I don't mind spending a lot on skincare but I must ensure that they benefits my skin. I mean, who doesn't want that?